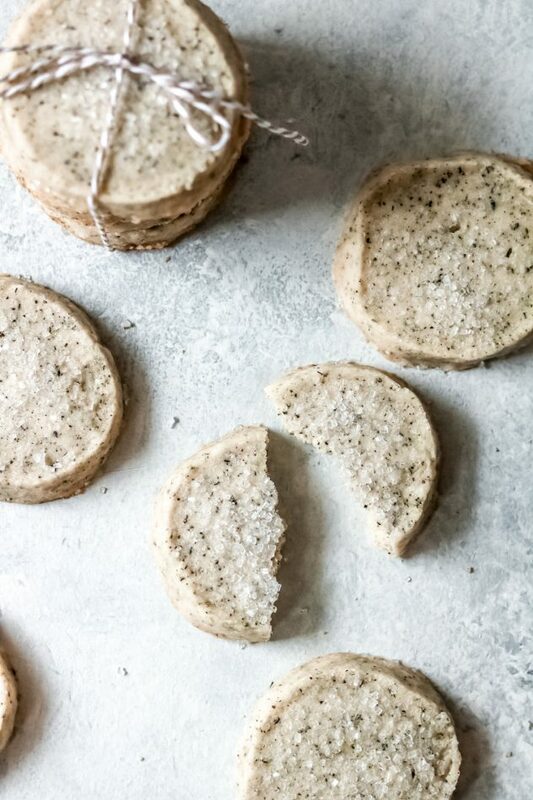 Curl up with a warm cup of tea and one of these gorgeous London Fog Shortbread Cookies. 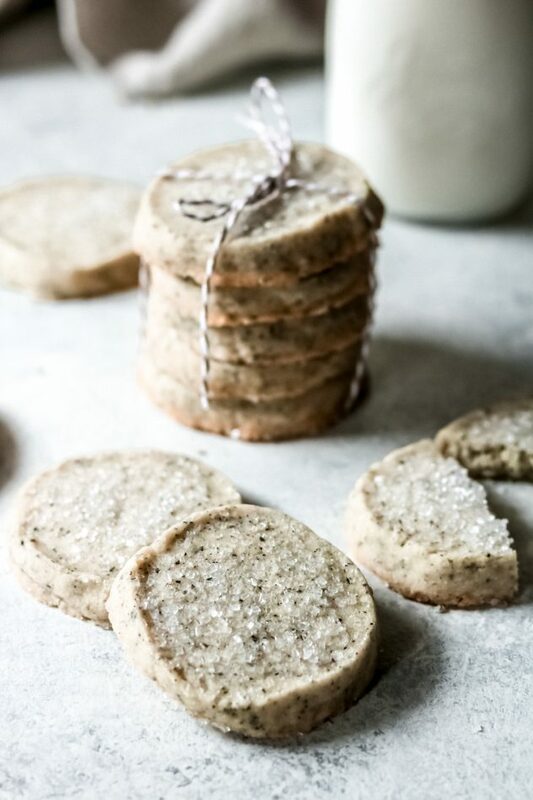 Similar to a London Fog latte, these London Fog shortbread cookies bring forth the flavors of Earl Grey tea and warm milk. They’re perfect for your next brunch! A couple of years ago I experienced my first London Fog latte, and I was hooked. It’s a latte made with Earl Grey tea, and it is delicious. These London Fog shortbread cookies capture the flavors of this drink perfectly. It’s all the flavors of a London Fog latte baked into a soft, buttery shortbread cookie. What I love most about shortbread cookies is that they are SIMPLE to make. Shortbread cookies, in my opinion, are the easiest cookies to make. With just a handful of ingredients, they’re simple and don’t require a lot of technical baking skills. These cookies bring an elegant flair which makes them the perfect simple yet elegant recipe. These cookies would be great for your next brunch, book club, or even holiday gathering. So for a challenged baker like myself, these London Fog shortbread cookies are right up my alley! Like I previously mentioned, shortbread cookies are fairly simple cookies to make. Add butter to a large mixing bowl and allow it to completely soften at room temperature. Once butter is softened, add powdered sugar and vanilla to the bowl with the butter and mix on low until completely smooth and creamy. Add in flour, salt, and Earl Grey tea, mix to combine. The dough should be thick and easy to manipulate. Lay out a sheet of plastic wrap, and transfer the dough on top of the plastic wrap. Use your hands to begin to form the dough into a log shape. Next, wrap the dough with the plastic wrap and then roll the dough with your hands until it forms a nice smooth log. You can twist the ends of the plastic wrap to keep the ends secured. Keeping the log wrapped, transfer to the refrigerator and refrigerate overnight, or for at least an hour. Remove the refrigerated dough. Unwrap and remove from the plastic wrap. Using a knife, begin slicing your dough into 1/4 inch round slices. Place sliced cookie dough onto a lined baking sheet. Sprinkle with decorating sugar and bake for 13-15 minutes. Transfer cookies to a cooling rack to cool, then serve and enjoy. Store in an airtight container. 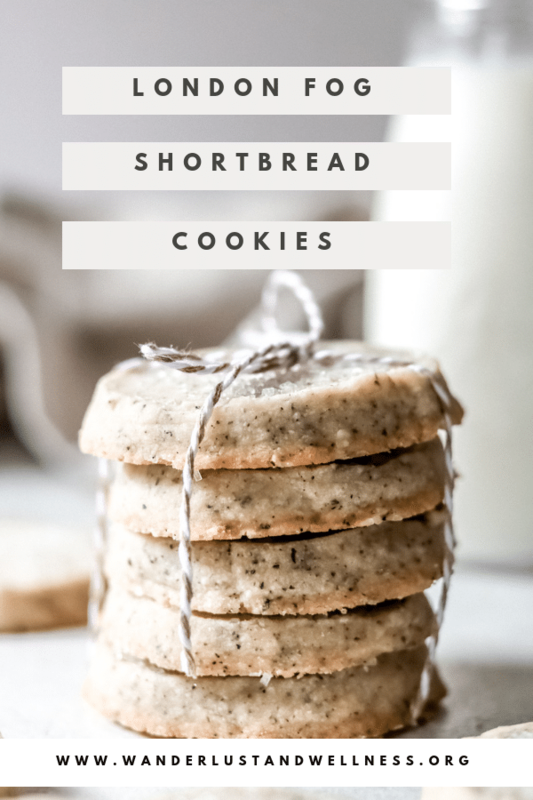 Enjoy these other shortbread recipes! 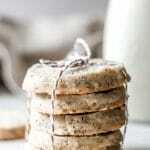 Capture the flavors of your favorite earl grey tea with these London fog shortbread cookies.